Tomorrow brings back the Champions league format for 2011/12 season and will be held in that big German spare tyre known as Munich’s Allianz Arena. As German spare tyres go it always makes me think of Helmut Kohl for some reason – I mean, who’d want to be referred to as a big Helmut! Anyway, moving on, as the journey proper starts in Dortmund and this could prove to be a tricky test. They’re the champions of Germany (so obviously unseeded and in pot B for the draw) and they are renowned for having quite an atmospheric stadium with both seated and standing areas allowing for a capacity of just under 81,000 fans. It has also been noted that they haven’t had the best of starts to the season currently sitting at 11th in the Bundesliga after an indifferent start. Nothing Arsenal fans could potentially imagine of and it’s obviously great going into a game against a team struggling to find form……..oh. Arsenal go into the match with a couple of players hoping to be on the plane not making it. Aaron Ramsey has picked up an ankle injury in training and to be honest I think a rest wouldn’t be a bad thing for Aaron at the moment given the amount of match play he’s had recently. It’s one think getting an ankle injury that you can recover from but it’s another getting a Jack Wilshere injury that seems innocuous at the time but end up being 3 months on the sidelines. Tomas Rosicky is also going to be out of the game and I’m sure he’ll be gutted at missing the chance to return to his former club once again. Tomorrow’s came is the start of a two-match ban extension to the one imposed by UEFA for Arsene not using his own phone to speak to the bench against Sudanese. Which in turn was a ban for the magnificent performance by Massimo Busacca in the game against Barcelona when he sent off RvP for continuing to take a shot some 100ms after the whistle had blown amongst 95,000 squealing fans in the Nou Camp. Therefore, Pat Rice will effectively be in charge tomorrow so no doubt we will see lots of flapping of arms from the touchline. Are the fans committed to the running of the club Yes The fanshare scheme is only a year old and currently has 2,000 members and has invested over £1M. This means that it is hard to differentiate top earners amongst the squad. New Stadium Hindering Progress Yes/No Arsenal is not getting the same value in the current market compared to other clubs. The number of partners is currently limited to long term exclusivity deals. This hinder underlying revenue for club rather than just impacting transfer budget. Transfer budget currently stands at £50M following summer activity. Therefore, this has actively not been spent. Reinvestment in the squad is not available No As mentioned earlier, the transfer fund currently sits at £50M. This is the amount left after recent transfer window. Money said to be spent only on players that can improve the squad. However, with revenue linked into aforementioned commercial partner deals the only way to increase revenue would be to have more success on the pitch. Double dilemma at the moment as current squad does not have the depth to push on through the final stages of the season in 4 separate competitions. Therefore, no investment, no progress. No progress, no prize money. No prize money, no investment, etc., etc. Arsene not willing to spend money True The transfer policy for the club is between Arsene Wenger and Ivan Gazidis. Are the board/owners actively managing Arsenal? It would seem not The perception is the Kroenke is not driving decision making at Arsenal and his investment in a strategic one. 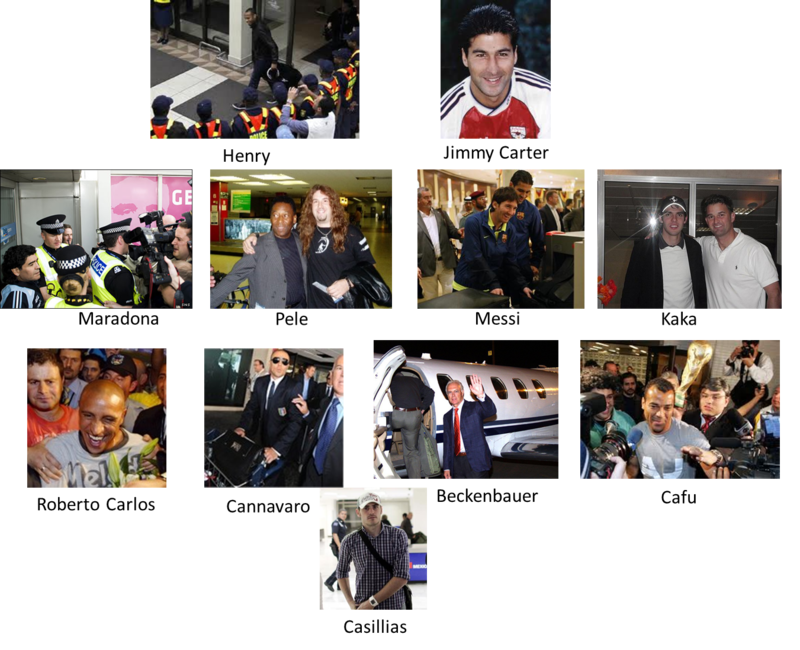 All team management and to that extent, the strategy of the club, is driven by Arsene Wenger. As highlighted above, the fanshare scheme could be at risk due to neither Kroenke nor Usmanov willing to release shares and Usmanov only releasing the same number of shares than Kroenke. Suggest that only individual purposes are being served rather than embracing fans desire to be more involved. Looking back over these comments there are some big areas of concern. The financial power that Arsenal may have had a few years back has gone and whilst it appears that it is not the actual debt of the new stadium that is holding the club back it is in fact the deal that were negotiated at the time that may have lacked a little foresight through the life the of terms agreed. This will impact the club for the next 3-4 years at least. Furthermore, and reading between the lines, there is a strained relationship between Gazidis and Kroenke with Ivan struggling to get Stan to commit to anything or become more involved in the over-arching strategy and implementation. I have been critical of the squad’s development since Gazidis joined the club and this was before Kroenke was heard of at Arsenal. 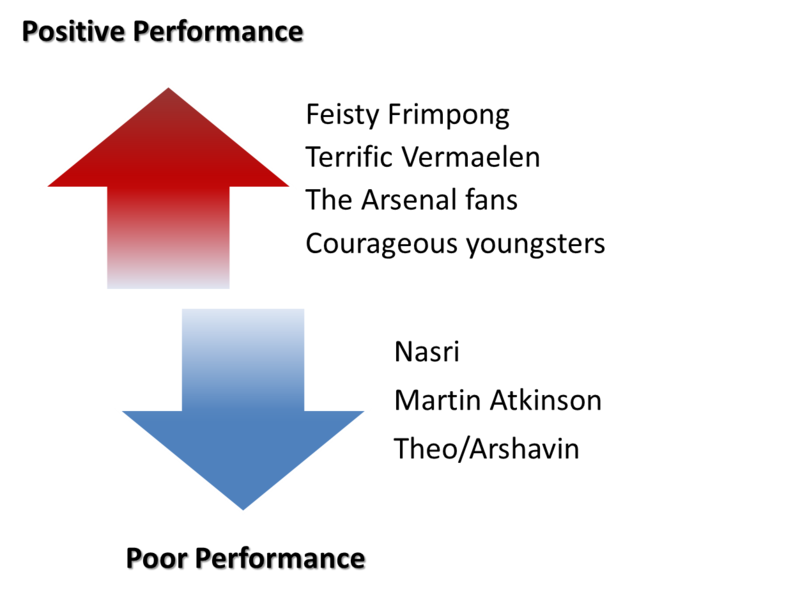 There seems to be some conflict here and as to what the resolution will be we will have to wait and see but this dynamic may not be something that will stand the test of time – something will break. What’s also concerning during the intervening period is that fans can expect additional trauma with transfer situations like the Nasri debacle that was just experience. Long term contracts needs to be resolved for Robin van Persie, Alex Song, Theo Walcott and Thomas Vermaelen and with the spectre of every Arsenal fans favourite agent, Darren Dein, hanging over these deals then we have some rocky times ahead. And people still cry out for the return of David Dein………! There will be more detail on the AST AGM via various channels but I’ve filled in my forms already for the AST and they have a stake at the top table and with the right approach, they have the chance to influence the future of the club. Thanks to @legrove and @DarrenArsenal1 for the updates during the AGM. Right, bring on Dortmund tomorrow – love a bit of Champions League! Until then, Auf Weidersehn Pet. 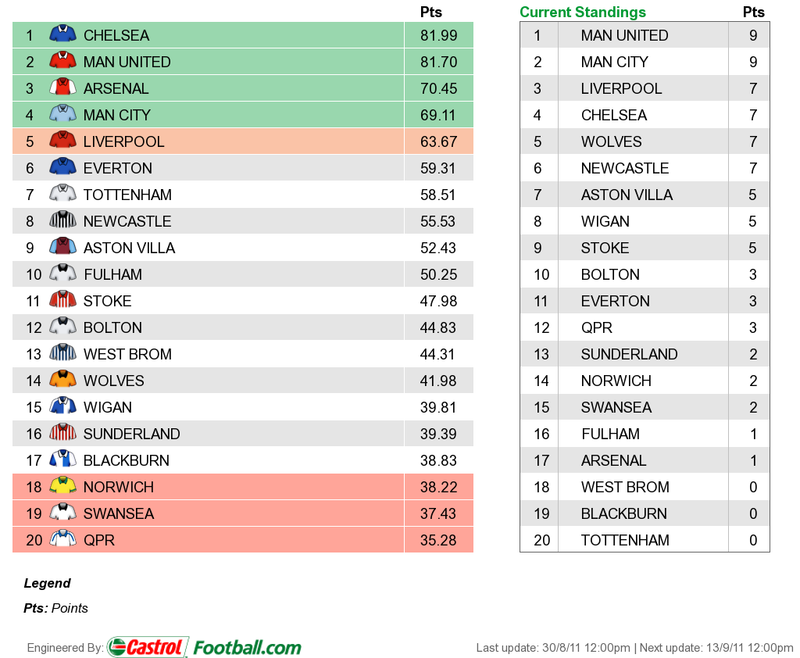 As I have been discussing in recent posts the facts tell the truth and Arsenal currently have only 1 point out of a possible 9 due to the slow movement within the transfer market over the summer. Yes, we’ve seen recent activity and vital strengthening in the final 48 hours of the transfer window but was this at the expense of not getting at least a win against a somewhat inept Newcastle team. Conceivably, there could have been a chance to have pushed for a point or 3 against Liverpool who really overcome an embattled Arsenal defence who had been reduced to 10 men and lacked the experience and resilience to close out the match to the 90th minute. So we have to deal with the situation as it stand and whilst we turn our noses up at the old clichés churned out by member of the club taking each game as it come and the next game is the most important one there is certainly a sense that the situation Arsenal find themselves in is somewhat self-manifested. What impact doe this potentially have on the final league standing come May? Who knows but looking at the Castrol Premier League Predictor tool, based upon home and away scoring coefficients (hmmm nearly got a bit too technical there), the best we could expect in 3rd. Better than some pundits would anticipate Arsenal on achieving and it would certainly be an improvement upon last year but we’re too early into the season to be grateful for 3rd in the final league standing and we’ll continue to review this prediction through the season. As nice as this looks it would be really nice if the folk at Castrol could crunch a few more numbers to calculate when we can celebrate St. Totteringhams day! Arsene’s first main press conference since the transfer deadline passed took place earlier today and included a mixed smattering of questions on missed transfer targets, squad updates for tomorrows game as well as how well equipped Arsene feels the squad is to compete in all four competitions on offer this season. The team is still also impacted by suspensions with three players out following recent red cards activities. Gervinmho, Alex Song and Carl Jenkinson will all be suspended for tomorrows game but Frimpong will return to Premier League action. Whether this will be in the starting line-up we’re yet to see. Other potential absentees could include both Park and Santos who are both in the squad but face minor challenges to make it onto the pitch. Park is currently stuck is Paris with visa issues to get into the UK whilst Santos is said to be a little short of match fitness. In this response he did not really recognise the void that Nasri and Fabregas left following their departures as this was still an area that was recognised as a need for strengthening whilst they were still present so the two new midfielders will offer something different but whether this is still progression in that department is still yet to be seen. The addition of Mertesacker in the short term only covers over the cracks in Vermaelen’s tendons but they will hopefully develop a formidable partnership when playing together. Santos is certainly an improvement over Traore and will leapfrog Gibbs and if Park can control a first time ball then he has an advantage of Bendtner already. So I have to agree with Wenger slightly when he says the squad has become more mature and experienced following recent acquisitions but there is still depth that needs to be added to ensure that this squad has the durability to last the whole season. This was also something picked by John Cross in the Mirror when trying to validate the so-called Arsenal Injury Jinx. The fact is that other teams have consistently had enough depth in the squad to carry injurys to the first XI. What was interesting today was Arsene’s comments about Jack Wilshere injury. The aforementioned article looks to allay concerns that players are being over-trained and over-played (the so called ProZone Red Area) but whilst Jack’s ankle injury was put down to bad luck he did seem to suggest that he had overused Jack towards the end of the season. So Arsene is still yet to address this lack of squad depth and we’re still in a scenario where we’re fielding players in the very infancy of the first team careers – we can only hope that this will change furthermore in January. In yesterday’s post I raised the point that it is usually for a home game against a newly promoted team of Swansea calibre to generate such pre-match interest and this is predominately due to off pitch activities around Arsenal. However, Swansea have earnt the right to be in the premier League and Arsene is certainly treating them with respect in terms of how he will approach the game. They’ve not had a bad start to their season considering their aspirations and after the 4-0 defeat on the opening day they’ve started out early in becoming misers for conceding goals with two 0-0 draws in their last games. “What they have achieved is absolutely magic, at this moment last season, no-one would have given them a chance, so what they have done is absolutely fantastic. We will see whether or not Swansea suffer from stage fright and they were certainly very active during the recent transfer window and we shall also get to see if their team will gel quickly. 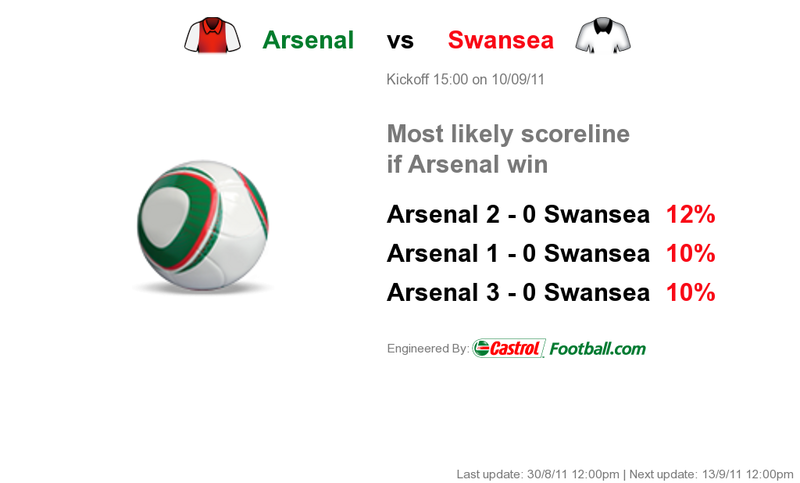 However, it’s odds on that Arsenal will win tomorrows game with a greatest likelihood of a 2-0 home win. Earlier this week there was talk on unrest and splits within the fanbase and protest were being planned against the board outside the ground. These have been subsequently cancelled now (but I think the billboard poster will still be there) as there has been a realisation over recent days that everyone needs to get behind the team and especially the new additions to the squad. Football is a results based industry and yes, there have been frustrations that the team have been under-equipped for the task in hand but the only real role that the fans can play at the Emirates tomorrow is to make the atmosphere as raucous as they can and help unnerve the Swansea players so that Arsenal gets the result that it needs. Bring on Saturday and another afternoon at the Emirates – I can’t think of anywhere else I’d want to be and am looking forward to toasting a victory during post-match drinks. 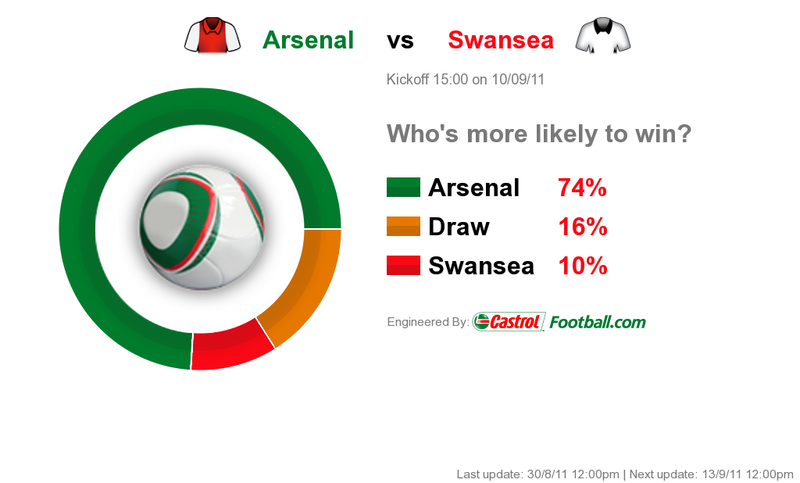 Arsenal vs Swansea: It’s back and it’s going to be spicy! Thank god that’s over – another round of international games have passed and we can move onto the more important aspect of the Premier League matches this weekend. This weekend is once again an important one in the recent history of Arsenal FC and will likely shape the rest of the season for the current squad, manager and their relationship with the fans. Normally, you would relish the opportunity to welcome a newly promoted team who are still looking to establish themselves against top level clubs. You only have to look back to last August when Blackpool came to the Emirates having just thumped Wigan 4-0 to get a pasting themselves and return home on the wrong end of a 6-0 drubbing. Yet Swansea offers a different prospect and this isn’t down to the visiting team themselves even though the facts state that they are higher than us in the league and have not conceded in their last two outings (even though this was only against Wigan and Sunderland!). There was much frustration over the lack of new players coming in over the summer period and for those signings that did take place the concern was that these were not sufficient to replace potential losses that were anticipated. In fact, this concern was realised very early into the new season with the losses of Cesc Fabregas and Samir Nasri. This was then coupled by Arsene Wenger playing a Champions League style Red or Black game with qualification against Udinese. If we hadn’t witnessed that £25 million save by Szczesny then would we have been able to have been so active towards the end of the transfer window? Yes, Arsene may have made enquiries of Arteta earlier in the window but would he have been able to convince him to move from Everton with a paycut and Europa League football? It was a risk and there was a certain element of luck involved too. At this time there can be no excuses, the season starts for real now and unless there is a significant purchase in the January transfer window who can make an immediate impact on the first team then the current crop of players needs to see us through to next May. After the dismal performance at Old Trafford you could sense that there was blood in the air amongst the fan base. Something needed to change and change quick. People were looking for scapegoats regarding the lack of investment in the first team, the asset stripping of out best players. Protests were being arranged for Saturday’s game and the signing of established and experienced international players in Park Chu-Young (26), Per Mertesacker (26), Yossi Benayoun (31), Andre Santos (28), Mikel Arteta (29) may have allayed these slightly. However, if this going to be sufficiently for all, unlikely and whilst there will still be some disquiet in some corners it will be interesting to see how vocal this will be. Throwing all of this into the mix and there is certainly a feeling that you can define your own destiny when managing a football club and this is achieved by make sound investments at the right time to strengthen certain squad in inadequacies. This has been a constant complaint over the past few seasons and there is certainly more visible after recent events but with new additions and the desire to succeed there should be a spicy atmosphere at the Emirates on Saturday even though it’s not Swansea that people will be going to see. The vast majority of fans will be there to get behind the team and this is all the team need and should expect from those entering through the turnstiles. There’s not be much else in the news today as everyone is returning from their international duty and tomorrow’s pre-match press conference will give us a greater sense of who received bumps and knock that may impact their ability to play at the weekend. We’ll also take a close look at the potential new starting line-up and some of the key player profiles as well as looking at some predictions as to where Arsenal could end up in the Premier League table come May next year. If you want to stay informed of all the latest posts from GloryGunner then you can either sign-up at the bottom of this screen to receive a healthy dose of Arse news directly via email or you can follow my latest comments on Twitter by following @Glory_Gunner. If you wish you share your thoughts and comments on the current situation then feel free to use the comments sections below. 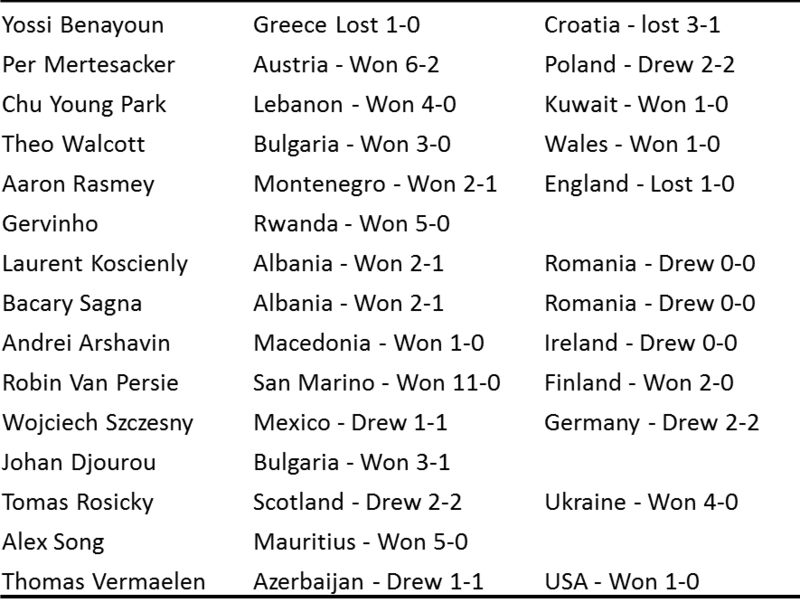 Two things seemingly occupying the minds of Arsenal fans at the moment – How many of the squad are fit and what was the impact of the recent round of international games? The two are intertwined but we wait to hear how the latter has impacted the former. However, the injury topic seems to have hit the headlines again following announcements this week that both Jack Wilshere and Thomas Vermaelen are both out for a number of months due to dodgy ankles. For some reason Vermaelen’s injury announcement came after he’d had a secret operation in Sweden. I’m not so sure why this was a secret? Has the Verminator been to Cyberdyne Systems to be upgrade from a T-101 to a T-1000? Who knows but it’s certainly a knockback for the new Vermersacker model that Cyberdyne were looking to release. If the reports are to be believed, we can expect to see Vermaelen back for Sunderland in the middle of October whereas Jack Wilshere will not be likely to return until mid-November for the game against Norwich. We wait to see how the bumps and bruises of the international break have impacted the players so we’ll look at a potential starting XI for the Swansea game closer to the time. There were some highlights for some even though the quality of the competition is debatable but the potential front line for Saturday’s game will be high on confidence after hitting the back of the net 9 times in 5 games. Gervinho played against Rwanda and sealed a 5-0 win by scoring the last goal just prior to the fulltime whistle. In terms of other players, there was the obvious match-up of Theo Walcott vs. Aaron Ramsey in the England/Wales games. This never came to fruition as Theo was withdrawn from the game with a suspected tight hamstring but Aaron put in a sterling Man of the Match Performance. I’ll admit it, the England games passed me by due mainly to my apathy for the English FA in their treatment of young players being picked for too many teams (e.g. both Theo and Jack being impacted in recent time by playing for both the U21 and Senior squads during the summer breaks), lack of Arsenal involvement as well as their inability to show any kind of consistency in overseeing the game. So why choose England when you can choose Ghana? Emmanuel Frimpong has confirmed today that his international allegiance will lie with the his country of birth rather than the country he has represented as a youth and will be joining the contingent of Arsenal players who we will lose each time the African Cup of Nations comes around. Whilst Frimpong has made an impact in his initial displays this season it was the future that could have made watching England more exciting again. Could you imagine an England line-up that included Gibbs, Wilshere, Walcott, Frimpong and Lansbury? Assuming that Lansbury doesn’t return from his loan to West Ham, it looks like England fans will have to make do with first three only. However, it would have been interesting to have seen a line-up that boasted similar Arsenal numbers that were last seen back in 1999. This was when England played the then world champions, France where starting line-up comprised of Seaman, Dixon, Adams and Keown. The only blemish on the landscape was Le Saux starting instead of Winterburn. The result was 2-0 but you can hardly apportion blame when the French team where on a high and compromised of Nickolas Anelka, Emmanuel Petit, Patrick Vieira and pre-Arsenal Wiltord, Pires. Thankfully the tedium of international football is over and the anticipation of the PL can continue. Arsenal haven’t had the greatest of start but now that this silly pre-season is over and the squad has been finalised let’s hope we get an appropriate response with 3 points against Swansea on Saturday. Only 4 more sleeps to the next game!! Totally reliable, honestly!!! It looks like Arsene is trying to sign a brand new team and they’re flying in as I type……..
Oh the joys of transfer deadline day titter tattle!! It was plain and obvious for many outsiders to see and painful for each Arsenal fan to ensure as Arsenal XI’s continued to fail when needed to push on and win some silverware. And the most recent response? During the summer we have seen Arsene ship out Cesc Fabregas, Samir Nasri, Gael Clichy, Emmanuel Eboue, Jay Emmanuel Thomas and long-term loan deals for Denilson and Carlos Vela. The replacements? Gervinho, Carl Jenkinson, Joel Campbell, Alex Oxlade-Chamberlain all of whom bought the number of Premiership games experience……0 (zero). Arsenal were given a few home truths regarding the strength and depth of the squad and endure a humiliating defeat at Old Trafford. The morning after the night before. All that could be heard was what changes need to happen and will they happen and if they do, is there enough time. Chu Young Park – Monaco striker and South Korean captain was halfway through a medical process at Lille when all of a sudden it was rumoured to be travelling to London to finalise a deal to Arsenal. What this will do for any hope of a future deal with Lille for Eden Hazard is yet to be seen but Park is now an Arsenal player. Chu is 26 years old and has won 53 caps for the South Korean national side (17 goals). Andre Santos – up to a week ago the Brazilian left back was looking forward to a season of Champions League football until Fenerbache were turfed out of the Champions League for match fixing and now facing potential self-relegation. Arsene has jumped on this opportunity to sure up the left side of his defence having cut loose the eternally under-performing Armand Traore. Santos is 28 and has won 22 caps for the Brazilian national side. If there was one signing that was needed this summer it was a new centre back to compliment Thomas Vermaelen and after all the talk of Gary Cahill and Phil Jagielka this signing is a real coup given the price, players age and national and international experience. Per is 26 and has won 75 (that’s seventy-five) caps for the German national side. It’s difficult to speculate 24 hours before a transfer window closes because there is going to be so much guff flying about that will never happen. Will we make another supposed bid to Rennes for Yann M’Vila? Have Bolton now burnt their bridges over the Cahill transfer? Will Yossi Benayoun or Mario Gotze (don’t google it!) being wearing red and white this season? If not, we’ll certainly get a first-hand look of the latter during the Champions League games against B. Dortmund. There’s also the potential for a few more exits. The futures of Nicklas Bendtner and Manuel Almunia were supposed to be resolved this summer. There’s been more talk recently regarding Bendtners departure but very little for Alumnia. It will be interesting in a curious way to see what happens but if Bendtner does stay he could still have a role to play this season. Also of late, if rumours can be beleived,u there has been some interest from Europe with Chamakh going to PSG on loan and Johan Djourou to Lazio. I’m not convinced that we can actually lose Djourou given the track record of injuries to Arsenal centre backs but a loan move for Chamakh could be a no-brainer. He’s not performing at the moment and if he can develop a bit more somewhere else then great. If not, going on loan puts him in the shop window for a potential transfer in the future. This is all very promising and there is still another 24 hours for Arsene to continue his spending frenzy before the window shuts. There’s still some work to be done as the weekend result clearly demonstrated that the current squad was severely lacking but there is now hope that there will be some more surprises to come. You can only hope that the relative lull in rumours in the past few hours is down to the Arsenal negotiation team are getting an early night tonight before a big day tomorrow. Let’s hope they’ve got plenty batteries in the phone, paper for the fax machine, ink in the pens to complete all the registration form and the premier league office on speed dial for final minute registrations. Roll on transfer day, it’s nice when you’re involved but if it turns out to be any anti-climax there’s always other channels. Here’s my disclosure for today’s post: I didn’t go to the game today, I do not subscribe to a TVsports channel owned by Rupert Murdoch, I only listened to the game on the radio and followed certain twitter feeds, I shall not be matching MOTD2 tonight. I am still proud to be an Arsenal fan no matter how much it hurts…………..but today it bloody hurts!!! Rather than go into the in’s and outs of a game that I thankfully did not have to view I put forward some reasons as to why the result today was inevitable and, in a painful way, might be the kick up the arse this club has gotten away with in recent time. Turn on the radio and listen to any post-match phone-in and you’ll hear both sides of the Arsene Wenger. No matter which side of the fence you sit there are some big areas of concern where Arsene seems to be shooting himself in the foot in his current approach to managing Arsenal. Unwilling to recognize the teams weaknesses: Time and time again we hear about this team’s massive potential and mental strengthness, however, this has never actually turned into results. How many times in recent seasons have Arsenal struggled against the title challenging teams as well as against teams that should have been beaten easily. Yes, there may have been the odd victory against ManUre and Chelsea but for every one of those there has been a Wigan or a West Brom or a Newcastle or a Bolton. Teams that should have easily been beaten and would have been beaten by Premiership winning teams that have produced that mental strengthness every week to win games against the run of play. Unwilling to recognise the failings himself: There was a story of the news the other day about a man who had been sentenced the other day for faking his army career having never served in the army at all. He had built up such a strong story to convince others that over the course of time he had convinced himself that the lie was in fact truth. I’m not suggesting that there’s anything untoward in Arsene Wenger’s head but the analogy does hit home and a small dose of humility in that a new course of action may be required with the current squad. If not delusional, then it would be more concerning that his approaching is complete arrogance and the current situation is entirely deliberate. Poor morale within the squad: We’ve heard some concerning stories this week including one in which the club captain sat down with the manager to discuss areas in which the team need immediate improvement. No progress was be made and RvP was left completely perplexed in the ambitions that his manager has for the current season. A season it should be noted in which Robin’s contract should be renewed in order to avoid another Nasri situation. Furthermore, how much should we look into the non-signings of Phil Jones and Juan Mata. After lengthy discussions with both players we now found them playing for two of Arsenal’s main competitors but if money was not the issue then why would they have turned down the chance to play for Arsenal? See also the “reason” why Nasri and Cesc left, the latter moreso when he in fact took a paycut to join a Barcelona team that still have Xavi and Inesta in their pomp. It’s not money but winning ambition. Why has the buying power of Arsenal dropped so dramatically? This has been touched earlier but how much does the current insecurity of the board impact deals? In the past year we have seen a boardroom tussle between Stan Kroenke and Alisher Usmanov with silent Stan apparently winning the battle. Yet, what difference have we seen from an outsiders perspective? By what measures is he deeming successful performance, and by this I mean in terms of investment purposes, because is the slide continues then unrest amongst the fanbase will ultimately result in left money in the coffers on a weekly basis. Surely success on the pitch equates to success on the balance sheet? At what point does Stan and the board intervene in either supporting the manager or not? Season 2011/12: Carl Jenkinson, Gervinho, Joel Campbell, Alex Oxlade-Chamberlain. Of those, only 2 (3 if you include Sol Campbell) would automatically slot into your first team now – Gervinho and Thomas Vermaelen. Not much return for 4 years work is it. The gaps between the players and the fans is becoming really evident now. It was only 2 years ago when the Arsenal team would join up in the centre circle straight after the final whilstle for a final team talk. OK, it all feel appart after that fateful game against Birmingham which Eduardo’s horrific injury and Gallas’ final minute tantrum. However, there was comararde within the team and with the fans. Nowadays, as soon as the whilstle is blown the players are straight down the tunnel without much recognition for the fans who pay the tickets that fund the wages. For a club of great history and demand for respect towards the paying crowd this needs reinstilling amongst the current crop of players. Fine, there are a minority that are still aware of need for a good rapport but the majoirty of players would be found guilty of not giving something back to the fans on matchdays. Player Indiscipline: Three premier leagues games into the new season and we have had 3 red cards and 1 retrospective suspension. I haven’t seen the two yellow cards that Jenkinson received today so cannot comment (and never will) but for the other three suspensions that the team are having to suffer, they could have been avoid. Song was petulant, Gervinho needed self-constraint and Frimpong’s first yellow could easily have been avoided. The current Arsenal team need to be more savvy in the way they conduct themselves on the pitch to avoided such penalties because all they do is end up causing harm to the team by making themselves unavailable to play. Inexeperienced Players: I said this previously in the Liverpool aftermath, you cannot expect players with little premier league experience to be able to complete with other teams that have built up collective experience of number of seasons. Add to that the mix of youth and it’s turned into a receipe for disaster. I have no doubt that given the right football schooling, some of these new recruits will go onto shine for seasons to come but right now it’s like lambs to the slaughter and is coming across as naive management. Whilst the youngsters should take a lot from the current experience, and (hopefully!!) be safe in the knowledge that it couldn’t get much worse, a club like Arsenal should not be in this position. Other teams have strengthened and have strengthened early. ManUre made the majority of their signings at the beginning of the summer and entered their pre-season in the knowledge that their squad was pretty much complete. Liverpool started in January and have continued throughout the summer. Chelsea have been slow but this can be put down to Andre Villas-Boas coming in himself part way through the summer. However, year-on-year Arsenal either leave it very late to make a signing or do nothing at all. In fact, like the British railway system, Arsenal are now suffering from years of under investment whereas our competitiors having just gotten stronger. Have a look at the table of net spenders in the past decade. Arsenal are only trumped by Blackburn in the profit making stakes but the bigger area of concern is the net investment vs winning intent/desire of the club to be able to compete for the best players. Can you imagine what Arsene might have acheived if he’s kept hold of his most valubale assests and then spent some more money on imporving that squad!!! Time and again we hear commentators saying that Arsene should be recongised for what he has acheived with the players that he has had. Fine, but there will not be a asterix next to Arsenal’s permier league standing in the footballing almanacs of 2068 stating *but fair play to Arsenal, they finished fourth but they had to deal with Chamakh up front and Eboue in midfield. It’s results that count I’m afraid…….. So tonight’s post has been a little bit doom and gloom but reality hurts I’m afraid. Today has been a time for a little bit of humility and soul searching to find the truth of the matter. And if the truth hurts then so be it – anything that can make Arsenal stronger should be encouraged. There is a core of players that do share a desire and have true heart for this club that need to rub off on the others in order to this team to evolve and become stronger. If not, then I’m afraid they need to be shipped out. Finally, and saving the best to the last, the best performance of the day would go to the away fans. It’s not the first time that Arsenal fans have done their best to urge on the team midst the face of adversity and woeful defending but the audible performance would have been heard around the world as 3,000 away fans out sang 73,000 ManUre supporters whilst they were 7-2 up. To hear “I’m Arsenal ’till I die” was heart warming on a cold day for all Gooners and the club should recongise this. And this is the point, this club is more than the players on the pitch, the state of the art stadium and the fancy merchandising and branding. It’s about the soul of what it means to be an Arsenal fan to enjoy the good times and regroup and be strong during the bad and kudos to those who made every Gooner proud to know what it takes to be a fan. The players who wanted to go off straight at the final whistle should take note. Jack and Frimpong send their best! Why does Arsene believe that the current crop of fit and non-suspended squad players are capable enough to challenge for the Premiership crown, let alone qualify for the Champions League group stage? What has happened to Samir Nasri’s supposed and very public move to Manchester City? How many more games do Arsenal need to lose before fundamental changes are made? There are no easy answers to any of these questions yet at the moment it would seem that our manager is not close to providing answers himself. Yesterdays game was a watershed moment for the club and for the fans in attendance the realisation that this season is going to be a very hard season, this for a club that has very much become accustomed to recent success and flowing football. Both were obvious by the absence yesterday. The starting line-up was certainly the best that could be put out in terms of those currently available. Whilst the line-up looked very raw and untested in previous games, this deflected from the big talking point as the crowds were taking their seats, what reaction was Samir Nasri going to receive when announced to the crowd? Inevitably, he received a mixture of boos and mild encouragement but there certainly wasn’t the same warm welcome afforded to the rest of the team. Unsurprsing though for someone who has either personally or had his agent’s team court a move away from Arsenal. If he loves the club as much as Arsene claims he does then my has a new contract not been signed yet. There were some bright moments to talk about but not enough to ensure a win. In the opening encounters it was clear that Liverpool were looking to leverage Andy Carroll’s aerial ability but this was well countered by the two centre backs and this summed up their first half. Not too many chances to talk about and if Arsenal had been stronger with the final ball on the break then they could have gone into the half-time break one up as the Liverpool defence was not at its strongest, or fastest. A failing on the day from our wide men. However, the best two chances came from Nasri and Frimpong who both took runs to set up shots from outside the box that challenged the Liverpool goal. The former’s run started from outside Arsenal box and ended with the ball zipping just past the post and the latter forcing a fine save from Reina who tipped the ball behind. Emmanuel Frimpong was extremely lively from the outset and was clearly relishing his starting debut on home turf. However, if you were look for a surrogate marker within the team for the current climate at Arsenal, Frimmers would be a prime example. After today’s performance Frimmers was clearly the best player throughout his time on the pitch and within 3 minutes a Liverpool player, Carroll maybe, felt the full force of his hard tackling style. Shortly after, Frimmers earnt himself his first yellow card for trying to delay a throw in and one that he would go onto to rue when receiving his second yellow for a strong and slightly high challenge on Lucas which any midfielder enforcer should expect to receive every now and then. This is why you need to protect your yellow card status in matches and earn a card when you deserve them but we now have three midfielders currently under suspension and between them only one deserved yellow card. Some discipline needs to be instilled across the team as these absences are being felt. The sending off of Frimpong was a turning point in the game and one from which the young team could not recover from. In the final quarter of the game the inexperience of the squad was harshly evident and whilst this is not their fault, the team, club and fans continue to suffer as a consequence. Arsenal lost their shape completely in the second half, the flow of passing was absent and the defence were unable to get the ball up the field. Both Arshavin and Theo had poor games and if your outlets are ineffective then chances are not going to be created. Theo was worryingly poor yesterday and seem to be very one tracked in his approach and the Liverpool defence soon learnt and read every intent. If Ronaldinho opened up a magic and trick shop then Theo should pay him a visit. Unusually, the substitutes warmed up at the opposite end to the normal warm up area and for those of us in the bottom left hand cornered we were shown the difference in squad depth with Mai Rodriguez, Mierieles and Suarez ready to come on. The latter two did come on and Arsenal were unable to adapt to the change in style. Yes, the first goal was unfortunate and there may have been a suggestion that both were offside but this is football and you have to play in the moment as results have never been changed in retrospect. There is no point moaning about what could have been, the scoresheet at the end of the game reads a 0-2 defeat for Arsenal. So what can be taken from the game? There were a few bright spots but not enough to grind out a point or 3 for the homing home game of the season. I’ve already touched on Frimmers performance but this was soured by his sending off. Thomas Vermaelen was very strong in defence and it’s great to see him back. If anyone knows if thee are an cloning factories out there then can we get a fast-track pass for Vermaelen? Can you imagine a defence made exclusively of Thomas Vermaelen quadruplets! Hats off to the crowd today. It’s really hard at the moment being an Arsenal fan with all this ongoing uncertainty. The crowd played their part today, they appreciated Nasri’s contribution through the game, advised a weak referee on what decisions he was missing and made the point that no matter was turmoil the team is going through the club and fanbase are bigger than that and they will give undeterred support. If you could convert that passion and desire from the stands to the scoreline then the game would have finished 2-2 at least! There were certainly very audible chants for the manager and board to spend some money but this is because the fans want to see success and not to struggle but the lack of financial investment. In terms of poor performances, as mentioned our wingers were poor. Neither Theo or Arshavin were unable to get hold of the ball and take players on. If this was down to the defensive prowess of the Liverpool fullbacks then fine but there was too many deadend runs and poor ball control to be able to give any credit. Samir Nasri was bright in moments and his turns and runs were lively but as with the back end of last season Nasri drifted out of the game when needed and if he were every to replace Cesc then this was what was needed. Another sign that £25M could have been another astute bit of business BUT ONLY if replacements were found. The potential is certainly there and when you see how Frimpong, Miquel, Jenkinson and Lansbury (for a shorter period) were willing to step up to the challenge then you have optimism for the future. But not now, not against Liverpool where every point counts. I know it’s early but at this rate we run the risk of entering September in the Europa League which only 1 point from 9 in the Premiership. As discussed in Friday’s blog, the concern was going to be how well will this squad acquit themselves against the big spending Liverpool. Liverpool certainly have a different squad to last years they have strengthened as a unit which is important if success is to be achieved at the end of a long and challenging season. So there are 10 days left of the transfer window. How the team will change over that time we cannot predict. One thing is sure – the next two games, away versus Udinese and Manchester United, will define where this season will end and what the future for the team is. I’m nervy but still have the faith. It’s tough this blind faith thing isn’t it! The second game of Arsene’s pre-season takes place tomorrow against the scousers at lunchtime. This is where reality hits home and the team get the opportunity to prove that they are ready to handle the gauntlet that Arsene has thrown down. If not, then the temperature inside the Emirates is going to go up a few notches. The problem here is that the way Nasri has conducted himself in the public has exactly been appeasing to the fanbase. Even if Nasri does start and performs well it will be interesting to see how the fans respond. I have a feeling that they might give him an initial chance as it would be quite vitriolic to boo from the off but you never know. The bench has been strengthed with the additional of Djourou to the bench. Whilst he may have receovered from his hamsting twinge I am not convinced that he will be risked unless necessary. In complete contrast to Arsenal, Liverpool have been flashing the cash on players who are well known to the Premiership. Not that it means they have suddenly into a super fantastic world beating team overnight but they have certainly strengthed since last year. Of the players in their team that have the potential to cause us problems it’s likely to be the two upfront, Suarez and Carroll. Let’s hope that the back four continue their current run of form and keep another clean sheet. In other news, Wenger has been charged by UEFA for his attempts to remain in managerial control during the first leg of the CL qualifier against Udinese. Another case of the footballing authorities of being over zealous in the interpretation of their own rules and it’s not as if he tried to smuggle himself into in dressing room by hiding in the linen basket. It’s unlikely he’ll escape further punishment but to what extent we are yet to see. Also, there has been confirmation that Joel Campbell’s move to Arsenal has been confirmed. His shirt number is yet to be confirmed as is a work permit, but you would like to hope that the work permit department at Arsenal have completed their homework this time and the application will be agreed first time around. Roll on Saturday’s match and in a voyeuristic sense that the reaction between the fans and the team/manager will be interesting to say the least. Let’s hope that all the talking is left to the pitch and here’s to an Arsenal win.